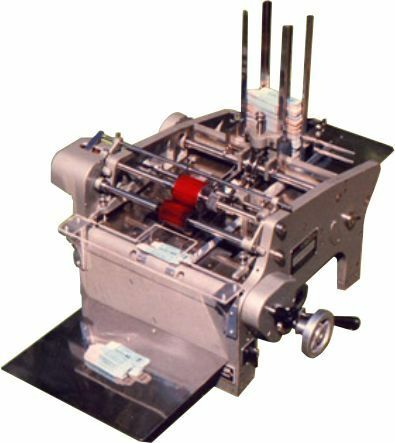 High Speed Stacking Carton Coder Model SCC – 300 – A for registered high quality multi-line overprinting of B.No., Mfg. Date, Exp. Date, MRP, etc. on only cartons (lock bottom also) of size 75 X 75 to 300 X 200 mm. The cartons are stacked on the vertical guides (Dispenser), automatically dispensed one-by-one by Pusher below, picked up by the pick-up rubber to feed to the printing roller via guide track and timing chain & stacked back in the collection tray automatically at speeds up to 250 per minute. (Free accessories include ½ Kg. Paste Ink, 1 Lit. Solvent & 2 mm Flat Rubber Character Set). This Coder is widely used in the Pharmaceutical & Food Industries for printing large quantities of Open Flap & Lock Bottom type Laminated Cartons. Printing Speed: 125/180/250 imprints / min. Weight (Approx. ): 125 Kgs net. 175 Kgs gross.